Awesome, thanks for the fix! Seems like stat collection is failing now that shards are live: the leaderboard is now static and the backend API shows that stats haven't been accumulating for the past 12 hours. The first empty bucket (at least for interval 180) starts at 2017-08-03T18:00:00.000Z. The experimental APIs are a bit bugged now. 'nukes' straight up doesn't work anymore and 'pvp' seems to use the 'start' query parameter for both shards, which necessitates inefficient queries as one shard clock is in the millions while the other is just now reaching digit #5. @tedivm: I'm not so sure. Any player who has previously farmed power will be at least GCL4, and even as things stand I'll almost always put my credits on the highest GCL player to dominate their novice zone. Denying them the ability to experiment with power creeps won't change this, but it will make them that much less prepared to engage with the rest of the world. Also for backups/testing! I like to periodically grab a snapshot of my memory & room objects for porting over to a private test server. Can we get access to node's Buffer class in the player scripts? 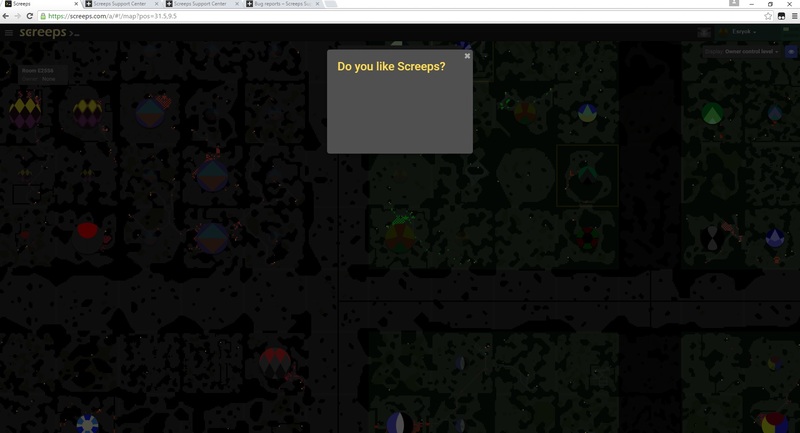 UI bug: Empty popup "Do you like Screeps?"